Hello, everyone! I hope that you enjoyed a peace-filled thanksgiving holiday. I was fortunate to be able to celebrate with my family including a lovely visit with my grandmother. Speaking of my grandmother, a few weeks ago while again visiting her, I read her local newspaper. The food section included a reader recipe exchange involving avocados. Up to this point, my experience with the fruit had been slicing it for a topping to a salad. However there was a recipe that caught my eye – Avocado Quick Bread, by MaryEllen Fabricatore and Pam Wobrock. 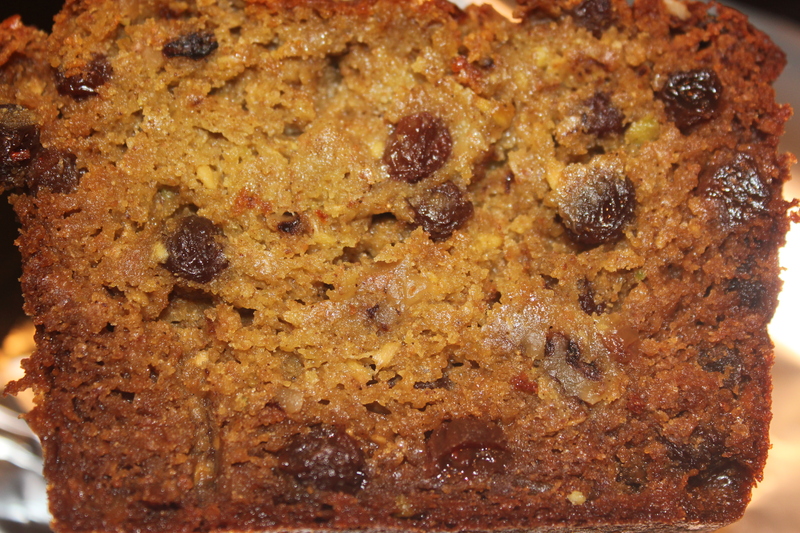 I was intrigued by the idea of mashing the fruit, full of healthy fats, fiber and vitamins, into a loaf of bread. And I had read that California avocados grow year-round, so I was excited to purchase some avocados right away and try the recipe. I substituted the refined sugar with honey and added whole wheat flour into the mix. And yes, the batter was green when I blended the ingredients together! However, after it baked it turned a golden brown color. This bread is very moist and has a nice texture similar to pumpkin bread. I hope you enjoy this tasty treat. –Heat oven to 350 degrees. Grease and flour a loaf pan. –Beat together honey, butter, eggs, vanilla and avocado until well blended. –In another bowl stir flours, cinnamon, allspice, salt and baking soda. –Add flour mixture to creamed mixture alternately with the buttermilk and mix well. Stir in the raisins and walnuts. –Pour into greased and floured loaf pan. –Bake 1 hour and 15 minutes, or until a toothpick inserted in the center comes out clean. I am sharing this recipe with Joy of Desserts, Simply Sugar and Gluten Free, Miz Helen’s Country Cottage, Food Trip Friday and Sweet as Sugar Cookies. This entry was posted in Recipes - Bread and tagged Avocado, Cane sugar free, Honey, Yeast free. Bookmark the permalink. You will definitely love this bread! Thanks for reading, commenting and pinning! Have a great day. The recipe sounds terrific, as always. I do have a question about an earlier recipe you posted for apple pie. In the recipe you called for two different crusts – one for the base and a different one for the top. I got curious – why? That’s a great question, Terri. I asked FIL why he buys a pie crust that’s different from the base. He says that he buys the Oronoque base because Julia Child always recommended that brand. However, he does not think that they also make crusts, so he purchases the Pillsbury top. wow. avocado bread or cake…that’s new to me. anyway, thanks for sharing the recipe. happy FTF. Hope to see you at my blog. sounds delish and looks yummy too 🙂 I never try this recipe, thank you for sharing it 🙂 Dropping some love for Food Trip Friday, hope that you can return the favor too. I did not heard of this kind of bread before hehe but looks yummy. I can’t wait to make this recipe I just know it will be delicious! Hope you are having a great week end and thanks so much for sharing with Full Plate Thursday.